Lately I have been on a ‘go totally paperless’ kick. I am an avid note taker and I have been for years. I take notes on ideas, thoughts, and just about anything I want to remember or do later. I am also the Queen of checklists. Seriously, ask my spouse! I carry a notebook in my purse at all times for such things. These days I have been carrying my trusted notebook and an iPad, and frankly lately I am thinking this is crazy. Technology has progressed over the years and there has got to be something out there that is going to meet my needs and replace my trusted notebook. 1. I have been doing a lot of research thus far on styluses I want to try out and iPad applications I also may want to use. One of the many questions I have for myself is (1) what do I want to do exactly, and (2) how am I using my paper notebook now? 2. I want to take notes. I want something that I can use a stylus with to hand-write my ideas, thoughts, and notes without the letters on the screen being one to two inches high, because if the letters are so big then you can only get one or two notes down before you have to start another page. What if I am at a meeting or at a lecture where I want to or need to concentrate on the speaker? I want to write notes down without having to concentrating too much on how I am getting the words down and how the letters are fitting on the page. Notes may include lists, flow charts, diagrams, and the list can go on here. 3. I want to be able to import images and write on them. A perfect example of this happened to me yesterday when our Handy-person came over to fix a few things for us. I wanted these floating shelves I got from Ikea installed in the baby room. 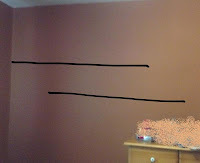 I wanted one shelve flush to the adjacent wall and the second one underneath it but over to the side part way. I needed some help expressing what I wanted. ‘A picture is a thousand words’ as the cliché goes so I grabbed my iPad, snapped a photo, and imported the image in an iPad App (I recently downloaded to try out). 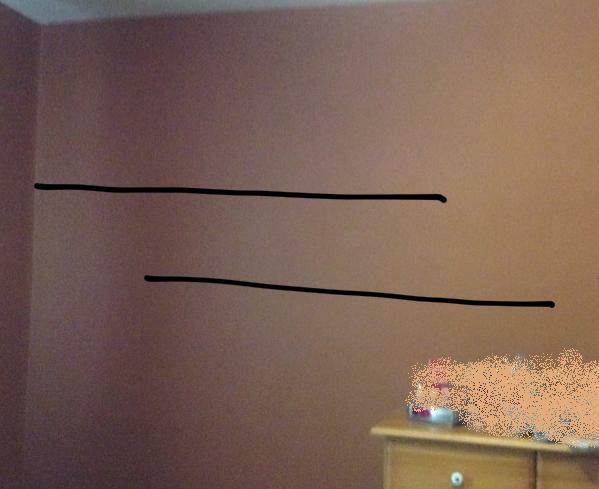 I used my index finger as a pen because I do not have a stylus yet and drew two lines to show approximately where I wanted these new shelves to be hung. My on the spot edited photo explained exactly what I wanted quickly and now my shelves look great. 4. I want to be able to draw out diagrams as well and then add comments to them. 5. I want to be able to save ‘pages’ as PDF (Adobe Portable Document Format) files. This is critical must have feature. 6. And lastly, I want to be able to import PDF files and write on them like I am making comments in the margins or filling out an application like I would if I had printed out the document and sat down with my pen. Thus far, I have a pretty distinct wish and needs list. So my journey begins, to go paperless I need to find a stylus that is right for me and an iPad app that is right for me.